Shakey Graves put on an amazing show at TURF in September! Exclaim TV got a chance to film him performing Built to Roam at the Horseshoe before his sold out club bonus series show. The video is now available – check it out! What are you doing for Halloween? Why not come enjoy Canada’s most insanest, undeadest and bestest psychobilly horror-punks The Brains when they celebrate Stomp Record’s 20th anniversary! They’re here with labelmates Los Kung Fu Monkey and East End Radicals! Tickets are going fast – get them now! We’ve announced our special Horseshoe Tavern 68th Birthday Party Celebrations! On Friday December 4, we host Lowest of the Low for our first birthday party, and then on Saturday December 5, we host The Strumbellas for our second birthday party! We can’t wait for a whole weekend to celebrate why the Horseshoe Tavern is called the Legendary Horseshoe Tavern! Lera Lynn has been making waves with True Detective! She performed an amazing version of her song “My Least Favourite Life” live at Resistor Studio, and we can’t stop watching it! We’re really excited to have her at The Horseshoe Tavern on November 14 with Dylan LeBlanc! Tickets are available now. Craig Finn was on Late Night with Seth Meyers last weekend performing an excellent new song off his solo record. He’s at The Horseshoe on Saturday Oct 17 with Esme Patterson! Tickets are available here. Due to scheduling conflicts, Andra Day regrettably has to cancel her show at the Horseshoe Tavern. We are sorry for this inconvenience and look forward to her returning soon! Refunds are available at point of purchase. 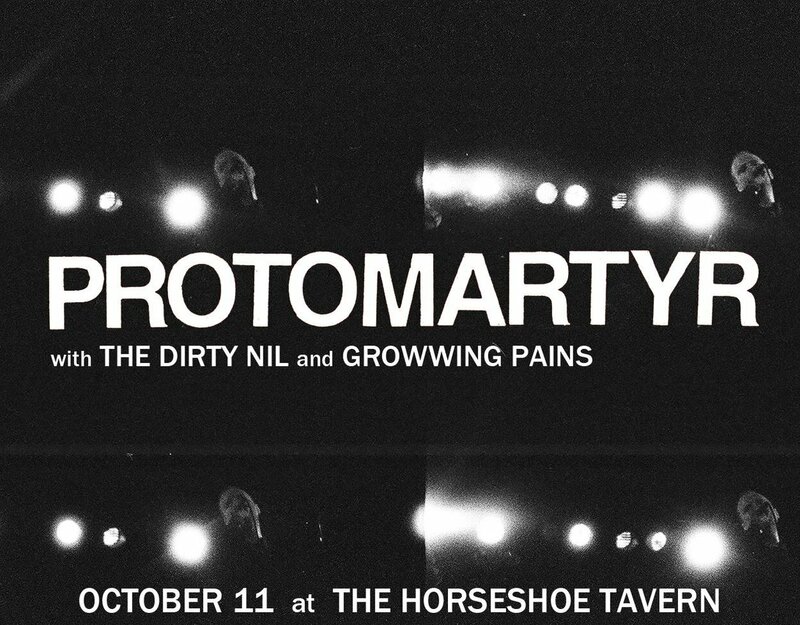 This Sunday, Detroit post-punks Protomartyr hit The Horseshoe Tavern with The Dirty Nil and Growwing Pains! Their new album got an amazing review in NOW Magazine recently – read it here! Get your tickets here! Toronto’s own Dilly Dally have an excellent new album out this week, and lucky for us they’re already streaming it! It has already generated a lot of buzz and some great reviews! Give it a listen here. They’re here on November 27 and tickets are available now here! Protomartyr are streaming their third record, and it’s already getting some excellent buzz and reviews! They’re here on October 11 with The Dirty Nil and Growwing Pains! Tickets are available here. Have you got your tickets for Titus Andronicus at The Horseshoe on October 13? No? You might want to do that soon – we’re running low on tickets! There are still a few online and both Rotate This and Soundscapes have some too! What are you waiting for?